Earn up to 584 reward points. 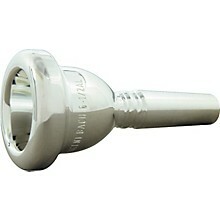 A carefully selected Bach mouthpiece can help improve a trombone player's embouchure, attack, tonguing and endurance. 1G / Deep / 28.00 mm / Medium thin, well rounded. / .319" / 800S / Extra large and deep for extraordinary power and depth of tone. 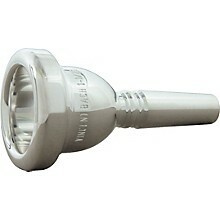 Among the largest and most powerful bass trombone mouthpieces produced today. 1-1/4G / Deep / 27.50 mm / Medium thin, well rounded. / .276" / 429 / Cup diameter is smaller than No.1G, but still very large and deep, with the sonority preferred by the modern American school. 1-1/4GM / Deep / 27.50 mm / Medium thin, well rounded. / .319" / 800S / Same rim and cup as No.1-1/4G, but with a larger throat and backbore for large, powerful sound, well in tune. 1-1/2G / Deep / 27.00 mm / Medium wide, well rounded. 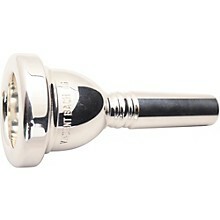 / .276" / 429 / A large mouthpiece with powerful tone in the low register and great carrying power. 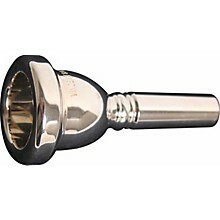 For many years, the standard mouthpiece for the serious bass trombone player. 1-1/2GM / Deep / 27.00 mm / Medium wide, well rounded. / .319" / 800S / Larger throat and backbore than the No.112G results in less resistance, larger dynamic range, deeper, warmer sound. 2G / Deep / 26.75 mm / Medium narrow. / .276" / 429 / Deep, full, resonant tone. Big low register even through the pedal tones. 3G / Deep / 26.26 mm / Medium wide, well rounded. / .276" / 429 / Same rim shape and diameter as No.3 small shank tenor trombone, but with a deep bass trombone cup, throat, and backbore to facilitate pedal tones. 4G / Deep / 26.00 mm / Medium wide, slightly rounded. / .276" / 429 / Same rim shape and diameter as No.4 small shank tenor trombone. A versatile, large diameter mouthpiece especially useful when only one trombone is used for both the upper and very low register. 4GB / Deep / 26.00 mm / Medium thin, very well rounded. / .276" / 429 / Same cup, throat and backbore as the No.4G with a more rounded rim. 5G / Deep / 25.50 mm / Medium wide, semi flat. / .276" / 429 / Same rim shape and diameter as No.5 small shank tenor trombone. Similar playing characteristics to No. 4G with a slightly smaller cup diameter. 5GL / Medium deep / 25.50 mm / Medium wide, semi flat. / .276" / 429 / Old style, shallower model than No.5G, facilitates upper range. 5GB / Deep / 25.50 mm / Medium thin, very well rounded. / .276" / 429 / Same cup, throat and backbore as the No.5G with a more rounded rim. 5GS / Medium deep / 25.50 mm / Medium wide, semi flat. 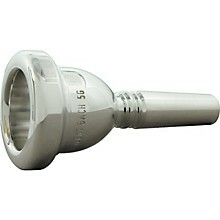 / .261" "G" / 420 (modified) / Shallower "G"-style cup with smaller throat and backbore than No. 5G produces easy high register, slightly brighter sound. 6-1/2A / Medium deep / 25.40 mm / Medium wide, well rounded. / .276" / 429 / Same rim and cup as No.612A small shank tenor trombone, but with full bass trombone throat and backbore for a rich, compact sound of large volume. 6-1/2AL / Medium deep / 25.40 mm / Medium wide, well rounded. 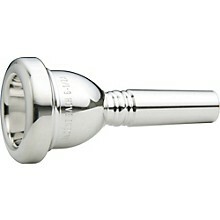 / .261" "G" / 420 / The same cup, throat, and backbore as No.612AL small shank tenor trombone but with bass shank. It requires a well developed embouchure. 6-1/2AM / Medium deep / 25.40 mm / Medium wide, well rounded. / .257" "F" / 413 / The same rim, cup, throat, and backbore as No.612AM small shank tenor trombone mouthpiece, but with bass shank. 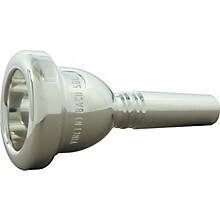 Get the right mouthpiece and play better! Order today.